Denver is continuously in need of plumbing experts. Plumbing problems occur out of the blue and are mostly unexpected. You can rely on SWAN Plumbing, Heating & Air of Denver to provide you with the most reliable, respectable, and professional plumbing service in Denver, CO.
We offer professional plumbing services for residential homeowners in the Denver Metro Area. Our plumbers are fully prepared and trained to complete any type of plumbing job immediately, so you don’t have to wait for an appointment on another day no matter what size the job is. SWAN Plumbing, Heating & Air of Denver has been providing customers with immediate installation, maintenance, and plumbing repair by our highly-skilled advanced plumbers. Our company is dedicated to serving plumbing needs in the most honest and ethical manner possible! Our company and our master plumbers at SWAN Plumbing, Heating & Air of Denver have been labeled as the most reliable and well-respected in Denver, as our reviews have demonstrated. With a Swan plumber on the job site, we can guarantee that you should expect the highest standard of customer service by our representatives. All of our licensed plumbers have been through rigorous, advanced training in order to become as efficient as they are today, and they will maintain the hard-work and dedication that has been provided to returning customers for years to come. Our plumbing contractors are guaranteed to work efficiently to provide quick and top quality service and installation to every customer in need. Every one of our plumbers have been through proper, professional training. They all have been and will continue to be mindfully drug tested and background checked to ensure you the safest and the most trustworthy services possible. Each plumber arrives wearing a professional company uniform and they will appear in our company vehicles. These company vehicles are full stocked to guarantee each customer the quick and dependable service that was promised. By having our company vehicle fully stocked, we can ensure you that you will not have to wait for certain parts needed to finish a job. In addition to all of this, each of our plumbers also wears shoe covers in order to keep your floors clean upon finishing a job. The Best Plumbing Company in Denver! 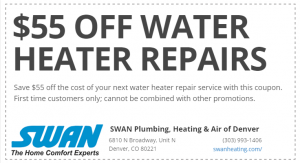 SWAN Plumbing, Heating & Air of Denver gives all estimates in writing, up-front, with no extra charges or unexpected fees! We maintain our title in being the most dedicated plumbing company in Denver by having these transparent business policies. When you are troubled with a plumbing surprise, call SWAN Plumbing, Heating & Air of Denver to schedule an appointment with a customer service representative at your convenience within a 2-hour window. Afterward, you can expect a trained Brothers professional plumber to greet you at your earliest convenience. Our plumbers have built our reputation over the years for our honesty and commitment to customer satisfaction, and we maintain and practice our value and code of ethics to every customer. Or, click here to schedule your Denver plumbing service online.